Illustrates the region around the first pitched battle of the Peninsula Campaign during the American Civil War. Campaign Maps Army of the Potomac Map No. 2 Williamsburg to White House Prepared by Command of Maj. Gen. George B. McClellan, U.S.A. This is an 1862 separate-issue Henry Larcom Abbot map of part of the Virginia Peninsula during the American Civil War Union commissioned by Major General George B. McClellan to illustrate his Peninsula Campaign. 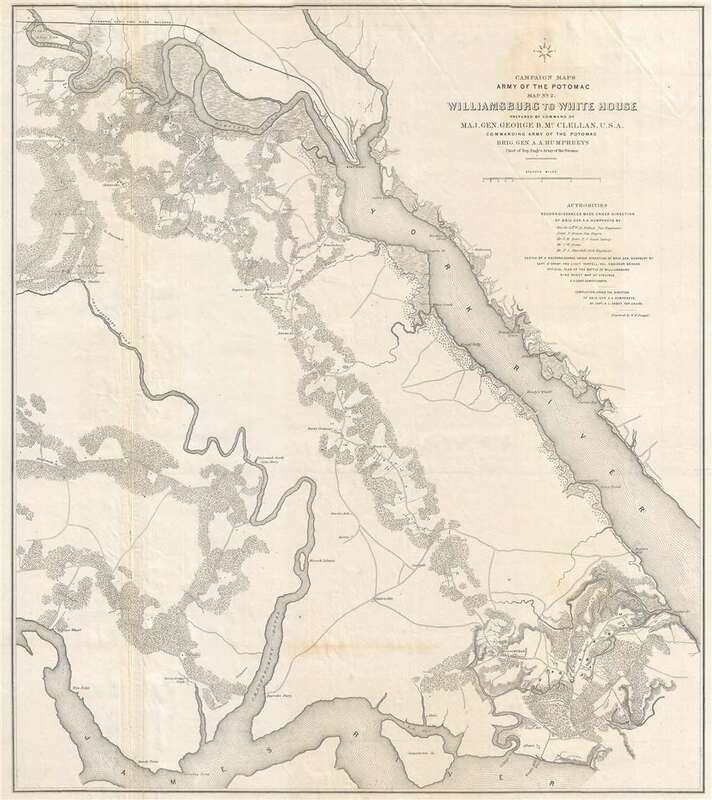 The map depicts the region from the James River to the York River and from White House and the Richmond and York River Railroad to Williamsburg and the James River. The second in a series of three maps, Williamsburg, Virginia, the site of the first major pitched battle of the Peninsula Campaign, is located in the lower part of the map just right of center. Although the theater of war is illustrated, very few notations are present that indicate the current state of war between Union and Confederate forces. Earthworks along the roads southeast of Williamsburg, known as Fort Magruder, are the only features that denote war. Roads, rivers, forests, and individual buildings are illustrated. Private homesteads are even labeled. But no indication of military maneuvers or other specifics about the campaign are present, which is the case for the other two maps in this series. This map was compiled by Henry Larcom Abbot under the direction of Brigadier General Andrew Atkinson Humphreys and engraved by William Henry Dougal and published by the army in 1862. Henry Larcom Abbot (August 13, 1831 - October 1, 1927) was an engineer and career officer in the United States Army. Born in Every, Massachusetts, Abbott graduated second in his class at West Point in 1854. Commissioned as a brevet second lieutenant on July 1, 1854, Abbot had initially wanted to join the Artillery, but a friend convinced him that the Engineers was a better option. By 1855, Abbot had been assigned to Lieutenant Robert Williamson's Pacific Railroad Survey in California and Oregon. Abbot also participated in several studies of the Mississippi River, including a notable study of the river's flow from the confluence with the Ohio River south to the Gulf of Mexico. Abbot was assigned to Brigadier General Irvin McDowell's forces at the outbreak of the American Civil War and was wounded at the First Battle of Bull Run. later, he served as a topographical engineer with the Army of the Potomac during the Peninsula Campaign, where he earned a brevet promotion to major at the siege of Yorktown. After the Peninsula Campaign, Abbot was transferred to command a heavy artillery unit, though that appointment did not last long as he was soon sent to Washington, D.C. to command a brigade defending the capital. In May 1864, Abbot was sent to command the artillery during the siege of Petersburg, and by December he was placed in command of all siege artillery in the Army of the Potomac and the Army of the James. After the war, Abbot remained in the army and served with the Army Corps of Engineers. He was placed in command of an engineer batallion at Willet's Point, New York, where he founded the army's Engineer Engineer School of Application, the first of its kind in the United States. After retiring from the army in 1895, Abbot continued to work as a civil engineer and was even employed as a consultant on the lock system for the Panama Canal. William Henry Dougal (January 30, 1822 - October 17, 1895) was an American artist and engraver. Born in New Haven, Connecticut, Dougal was apprenticed to Sherman and Smith, New York City-based engravers, at the age of 15. He was working independently as an engraver in Washington, D.C. by 1844, receiving his first large commission to engrave the plates for the reports of the Wilkes expedition. He spent 1849-1850 in San Francisco as the owner and operator of a livery and grocery store. Dougal returned to Washington, D.C. by late 1850, where he worked for the Bureau of Printing and Engraving, a position he held until his death in 1895. Dougal married Mary Virginia Adler in 1851, with whom he had seven children. Very good. Wear along original fold lines. Small area of loss along original fold line. Verso repairs to fold separations. Closed margin tears professionally repaired on verso. Light toning along original fold lines. Blank on verso. LOC G3883.J3S5 1862 .A2. OCLC 953568143. Rumsey 3878.000.